Steepholding is an off-grid, small-scale farm at Greenham Reach TA21 0JY near Holcombe Rogus and Greenham on the Devon & Somerset Border and part of the Ecological Land Co-operative. Steepholding is a tiny farm, 9 acres of very mixed land next to the River Tone on the Somerset and Devon border. The nature of the land makes it hugely diverse ecologically, and that in turn has influenced what we grow and rear here, with the aim of enhancing these diverse habitats. The human benefits are that we have created a more traditional mixed farm, which produces a wide variety of delicious food, plants and fuel. Asides from our phoneline we are completely off-grid, with the majority of our electricity coming from a shared solar system, heating by wood, and water from rain collection and a borehole. Waste water is cleaned through small scale grey water systems and our toilets are strawbale urinals and composting loos. Alex Wilson & Ruth O'Brien, moved with their two children to a caravan in an open field that they called Steepholding in 2014 . Previously, in Bristol, Ruth was working as a community market gardener in Hartcliffe (HHEAG). She also worked at Windmill Hill City Farm and taught organic gardening and permaculture. Alex was based at Ragmans Lane Farm, harvesting willow, making apple juice and mushroom logs when they met and became a bicycle mechanic when he moved to Bristol. In Bristol we were both actively involved in running Bristol Seed Swap and Somewhere Housing Co-op, and members of Bristol Permaculture group. Greenham Reach, Devon is a ground-breaking project of three affordable mixed smallholdings. It is the Ecological Land Co-op's first site, but they are rolling the model out across the U.K.
As tenants of the Ecological Land Co-operative we benefit from a 150 year lease and are committed to a management agreement for our agricultural tenancy, upholding the ecological nature of our farming and low impact nature of our lives and livlihoods. 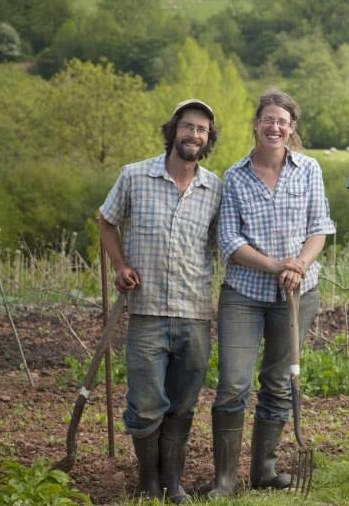 As members of the Ecological Land Co-operative we continue to receive their support in negotiating our planning permission to live on site, enabling us to look after a more diverse mix of farming activities.